Looking for an Elegant & Affordable Alternative to Place Cards? 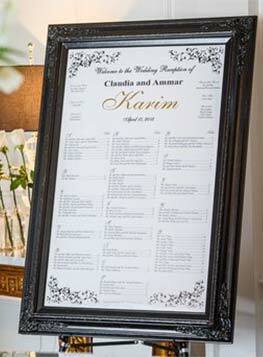 Present your Guest Seating in style with our Personalized Seating Charts! For local customers who are able to pick up and return their charts from our store locations, we offer a Seating Chart Rental Package for the exceptionally low price of $149.00. This includes: A 24 x 36 Chart Insert (yours to keep) and a frame & easel rental for a 1 week rental period. Sample Charts are on display at both locations. If your guest list is over 180 people, we highly recommend using our Double Seating Chart Rental Package at $249.00. If your guest list is under 100, may we recommend our 16 x 20 Frame Rental Package for $99.00. OUT OF STATE or HAVE YOUR OWN FRAME? Provide us with your guest list and table names/numbers and we can create your seating chart insert within 5 to 7 business days. Custom Sizes Priced upon Request. Rental Packages: A non-refundable deposit of $20.00 is required to reserve your frame and Seating Chart for your date. Please click below or call us to reserve your date today! Once your date is reserved, we require your guest list and Table names/numbers 7 business days before your Event. All details will be coordinated by phone, fax and/or email. Printed Insert Only: Please click above or call us to place your order. Your Seating Chart details will be coordinated by phone, fax and/or email.